Simply put, hearing aids are devices that amplify sound to help improve hearing. While no device can restore hearing, hearing aids work very well when fitted and adjusted appropriately. Hearing aids come in various sizes and shapes, ranging from tiny instruments that fit deep into the ear canal to amplifiers that are worn completely in the bowl of the ear and those that are worn over the ear or behind the ear. If hearing aids are recommended for your child, you will most likely have many questions about their appearance, function, and cost. Selecting the right hearing instrument requires the assistance of an experienced pediatric audiologist. The audiologist will be able to recommend the device that best suits your child’s needs and preferences. And while selecting the right hearing aid for your child is a serious process that requires active participation from you as a parent, it can also be a fun and exciting time for you and your child. 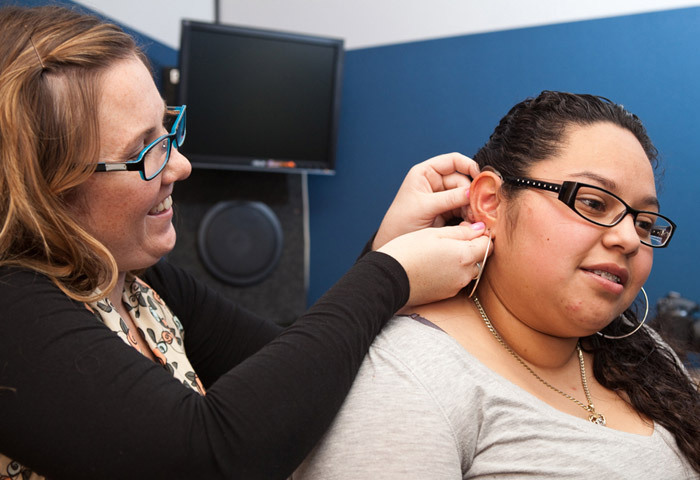 Hearing aid consultations at the Center are free of charge. You will need to bring past hearing tests and records, and your child’s attendance is usually required. We encourage parents to allow older children to be active participants in the consult, as this is an empowering part of the process that gives your child ownership over their hearing loss. We also understand that cost is of great concern, as hearing aids are very expensive. Most insurance companies do not cover the cost of hearing aids, although some plans do offer benefits for children. We will help you figure out options for payment and even refer you for state coverage or other programs when appropriate. Some children with severe to profound hearing loss or auditory neuropathy/dys-synchrony will receive little speech understanding benefit from hearing aids. In these cases, children may be referred to a cochlear implant team for assessment. A cochlear implant is an advanced, surgically placed device which picks up sound waves and transforms them into electrical pulses that are delivered directly to the auditory nerve. While cochlear implants do not restore hearing, when combined with specialized communication training, they may help your child develop spoken language. Before they can even be considered, a whole range of medical criteria must be fulfilled. Through a partnership with UCSF, the Hearing and Speech Center offers a program called Cochlear Implant Interconnect to help families through the process. The the American Speech-Language Association Cochlear Implants page offers detailed information on what cochlear implants are and how they work. Cochlear implants are not appropriate for all children and there are bioethical questions surrounding their use. The Laurent Clerc National Deaf Education Center at Gallaudet University provides an excellent clearinghouse of information through their Cochlear Implant Education Center site. Please note that while the Center provides comprehensive hearing aid services, we are not a cochlear implant assessment or service clinic. Our pediatric audiologists can talk to you about cochlear implants, but for assessment you will be referred to another facility in the Bay Area, such as UCSF or Stanford. Your child’s hearing instruments are the first step to better hearing. But in noisy environments, particularly the classroom, a personal FM (Frequency Modulated) system can greatly improve your child’s listening and learning experience. Classrooms are difficult listening environments even for children with normal hearing. This is partly because the teacher’s voice has to carry a long way, but is mostly due to background noise – feet shuffling, chairs moving around, students talking, papers rustling. Additionally, many classrooms have poor acoustics because of the lack of sound-absorbing materials on the floor, walls, and ceilings. A personal FM system is composed of a microphone and transmitting device, worn by the teacher, and a receiver, worn by your child and coupled to their hearing aids. Your child still hears everything as usual through their hearing aids, but the teacher’s voice (and therefore lesson) is heard at a level louder and clearer than all of the background noise. Public schools are responsible for ensuring your child has access to an FM system in the classroom, but many families also opt to purchase one for home and personal use. There are many variations and possible set-ups when it comes to FM, which your child’s audiologist can discuss with you. Today’s hearing aids are capable of connecting to cell phones, personal music players, gaming devices, computers, televisions, and so forth. This means that children with hearing loss can turn their hearing aids into their personal headsets! These interfacing “streaming” devices use cables or Bluetooth technology to grant children with hearing aids access to any audio signal. Your child’s audiologist can tell you more about these devices, which range in price and function. Other hearing aid accessories include items for care and cleaning, retention cords, sweatbands, decals and stickers, and charms and letters that connect to ear mold tubing. There are many options out there to make wearing hearing aids fun!